Joining a coworking space means working alongside people who are chipping away on any number of projects or innovations. Our member spotlight series is designed to help you get to know what other Duo Works members are working on, so that you can have deeper conversations in the kitchen or maybe even collaborate on a project or two. For this spotlight, it was our pleasure to interview Manzoorul (“Manzoor”) Hassan. 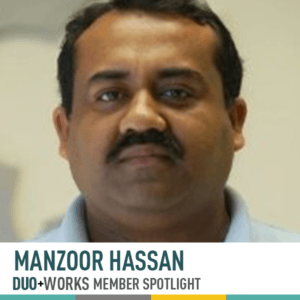 Before we dive into the interview with Manzoor, let me say that he is one of our most visible members who is always welcoming and checking in with everyone at our Duo Works family, and I’m proud to call him my friend have him with us as a reserved desk member. Manzoor is a software engineer who is currently working on a startup venture that will launch soon. Manzoor, where are you originally from, and when did you move to Austin? I am from Bangladesh and I came to Austin to go to School (UT) back in Fall of ’89. I stayed to take advantage of some opportunities that opened up and also I really, really liked being in Austin. It had become home. Not just home away from home, but home. I have been in the software field for over two decades and it was just time for me to do something on my own. What’s going on with your business right now, and what are you most proud of? Right now I’m excited about building our team and getting things off the ground. I’m proud to say that we just hired a software developer; he started this month. I like the people and the environment. There are some really interesting people working on some really interesting projects of their own that they are very proud of talking about. But, at the same time, I am able to be by myself when I need to. Anything and everything ;~) Seriously. There is nothing that I can think of that I would not be interested in hearing your thoughts about. I am re-watching Game of Thrones and watching “West World” and the “Big Bang Theory.” I’m also always watching re-runs of Seinfeld, Cheers and MASH, and I just finished a couple of books by Haruki Murakami. Manzoor is just one of the many friendly community members who makes up the fabric of Duo Works. We’d love for you to get in touch with us and schedule a tour. Click here to book a tour with Duo Works now.